Formed in Dayton, Ohio in 2001. Playing from the start on self-booked tours across the country gave them some initial national exposure, but they weren't signed to Victory Records until late 2003. As one of the first bands to utilize social networking to gain a fan base, Hawthorne Heights developed a huge MySpace following that became a catalyst that would launch them from underground to international awareness. 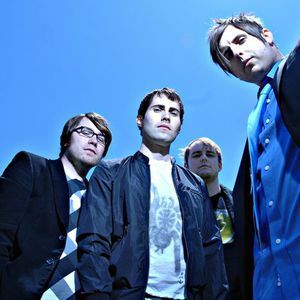 As one of the first bands to utilize social networking to gain a fan base, Hawthorne Heights developed a huge MySpace following that became a catalyst that would launch them from underground to international awareness. The band became regulars on MTV, their signature hit Ohio Is For Lovers the anthem for the new wave of ?emo?. Their debut album The Silence In Black And White soon went Gold, and with their second album If Only You Were Lonely, the band scored Victory Records' biggest ever debut, landing at #3 on the Billboard 200 in 2006. The band appeared on Conan O'Brien and Jimmy Kimmel, and became magazine cover stars, sending sales of The Silence? to Platinum status. In November 2007, whilst in the midst of legal disputes, tragedy struck within the Hawthorne Heights family. Casey Calvert, the much loved guitarist and resident ?screamer? of the band, lost his life while on tour, due to an accidental overdose of medications prescribed by his doctor and dentist, which proved to be lethal combination. The effects on the band were evident, both personally and musically. On August 5 2008, Hawthorne Heights return with Fragile Future, a brand new album. Although the sound is still distinctly Hawthorne Heights, the music, as with the band, has understandably evolved. ?After spending the last 2 years in a deep dark place, we decided to try to find the bright lights again with Fragile Future,? noted singer J.T. Woodruff. ?We, as a band, noticed that everyone has tremendous ups and downs, so we wanted this record to communicate that. We chose the title Fragile Future, because it sums up the current state of our band, as well as what is going on in the outside world. We must all make good choices to create a better situation in our lives.? "With the loss of Casey, and no plans to replace him, we've had to make some obvious changes to our sound on this record,? added drummer Eron Bucciarelli. ?Originally there were less screams planned for this record than the second one, but sadly we never got the chance to do even that. This forced us to take a creative approach to certain songs. We've beefed up the guitars in parts, added gang vocals, choirs and all sorts of effects to still capture some of the energy that Casey brought. ?